Rattan is a very eye-catching all season material used in most outdoor and patio furniture types. It has so many advantages over other types of outdoor furniture, as it is weatherproof and resistant to UV rays. A Rattan recliner can make for an exquisite outdoor or Patio seat, that will provide you with hours of comfort and relaxation. On the other hand, this Type of recliner is so versatile and appealing, you can even use it inside your home. Very low maintenance and extremely easy and simple to clean and keep clean. Rattan is a robust, hard-wearing, and durable, material that will last you quite long. Rattan furniture can easily withstand UV rays, and will not fade or crack in sunlight. Most Rattan pieces are extremely lightweight and easy to move around, although they are tough and durable. The most Versatile material that looks superb both indoors and outdoors not just like a recliner, but other furniture pieces alike. Rattan is naturally SUPPORTIVE and COMFORTABLE, because of its flexibility and durability. 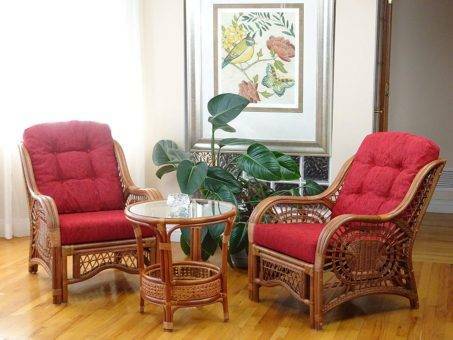 Rattan furniture is similarly affordable and easy to come by, making them a budget-friendly investment. 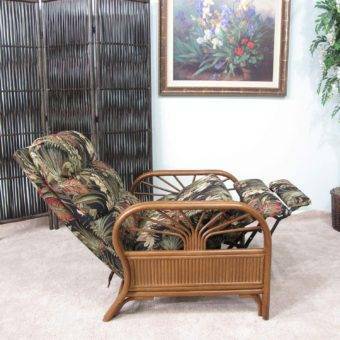 There are so many options when it comes to rattan furniture, so besides your recliner you can similarly get other matching pieces and create a whole set for your living room or patio. Buying such light, flexible, durable and affordable furniture has so many benefits, and will create the most appealing decorative interest pieces in your home. Rattan recliners are most suitable outdoors, on a Patio or at a Beach, or Holiday home. Rattan has a Summer feel to it, because of its light and natural appeal. Although Rattan furniture, if it suits your home theme and décor, can be used in any area of the home. What I like about rattan is its lightweight, and the fact that it is safe for children and pets, as well as so durable and easy to clean. Therefore I would recommend a Rattan recliner, and furniture as ideal for family use. From Urban design Furnishings we have the very simple, yet elegant, Rattan Style recliner with fabric upholstered cushions in a fun and decorative print. Ideal for both indoor and outdoor use this recliner will not take up much space, although it is fully packed with comfort features. Manufactured with a Solid Wood Frame, that is highly durable and sturdy with a golden brown finish. The cushions and padding have a Cotton Polyester blend, upholstery which is soft and comfortable, yet tough and easy to clean. An elegant and decorative design ideal for both indoor and outdoor use. The Kingrattan Rattan recliner has a simplistic and modern design that is ideal for any home space, with green soft cushioning and padding for comfort. A compact and feature-rich recliner with a solid hardwood frame in a darker color. Soft High density foam filling for plush comfort and support. Colorful, velvety soft upholstery that is durable and easy to clean. Comes with full recline features, for you to relax and unwind after a long day. The perfect size and shape for smaller spaces and outdoor use. I simply love this design, particularly as an outdoor furniture piece. It is comfortable and offers full recline, with the addition of a handy, pops out drink tray. 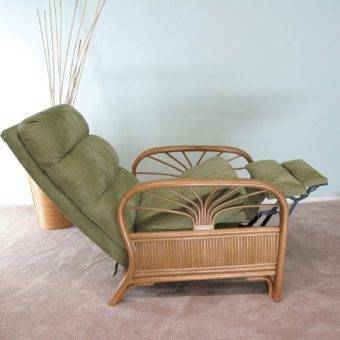 The Rattan material in Wicker style on this recline is all weatherproof and extremely durable. Full recline and an adjustable footrest, for superior comfort and relaxation. There is an additional Pop Out Drink Tray, for further convenience and enjoyment. A stylish contemporary design from a durable polypropylene resin material to replicate the appeal and feel of Wicker. Completely fade resistant and UV resistant, as well as heat, cold and rain resistant. Ideal for all year round outdoor use. The Mupater Patio PE is a gorgeous design with dark wicker frame and finishing, and a cream colored soft and comfortable cushion. Besides being exceptionally durable this recliner is likewise UV and weather resistant with strong rust-proof properties, making it an excellent choice for outdoor and indoor use alike. Extremely comfortable with a Rocking, and reclining features, as well as a retractable footrest for further relaxation. A specialized constructed back angle allows for a deeper rocking feature that is balanced, smooth and light without constant pushing. The smooth reclining mechanism that can adjust to any position, with a retractable leg rest that is also cushioned for comfort. The Backrest and footrest allow for simultaneous adjustment giving you much better flexibility, and full relaxation. Very durable, as well as UV resistant and rust proof. Can hold up to 400lbs in weight with its highly sturdy and strong frame. The Art to Real Recliner is a compact yet very elegant, Modern Contemporary styled recliner, with dark rattan finishing and a plush fabric cushion. there is a variety of color options in the cushion style for you to choose from, to complement your own style and decor. Very easy to assemble this piece by yourself and it comes with full and very descriptive instructions. An exquisite recliner for both indoor and outdoor use, with softly padded back, footrest and seat cushions, in a variety of color options. The Wicker design is hand woven for strength and durability, and there is a powder coated aluminum frame for sturdy and robust long-lasting strength. Completely UV resistant and will not crack or fade in the sun, as well as water and oil resistant. The Cushion and padding for this recliner are available in a neutral and soft Beige color, or Khaki color, as well as a darker Navy blue, and a bright and bold orange color option for you to choose from. Easy recline functions and a retractable footrest for comfort and convenience.